The writing and signature are almost fac-similes of specimens of C. M. Bennet’s writing in my possession, especially the signature, there being just about the difference that would naturally exist between pen and slate writing. On the following Friday I went, in company with Mr. Greeley, and made a most thorough investigation of the premises, going into the cellar, upon the roof, and through evey room, and testing the strength of the floor, ceiling, and walls of the closet. The closet is 17 inches deep, some three feet wide, and six feet high, being framed into the house, and as will be seen in the diagram, the walls of the closet being partly formed by the walls of the rooms. The ceiling of the room is formed on the rafters of the roof, and the closet at the top takes the shape of the roof, thus making it impossible for any one to be secreted above, while the floor of the closet is the continuous floor of the room. There is a ceiling in the closet made of matched flooring, securely nailed in its place. Now Mr. Editor, as this communication is sufficiently lengthy, I will defer any comments on the subject for the present. One thing, however, I will say, that if D. M. Bennet did write the foregoing message to me, he certainly assisted me in the debate with Braden, in overthrowing the position assumed by Christian Spiritualists and the whole metaphysical screed concerning the dualistic theory of matter and spirit, for my position in that debate was that there is nothing in the universe but matter and force, and that all phenomena in nature are referable to them. This examination of my house referred to by Stewart, was the first one made in daylight, and was supposed to be thorough by those who made it; but they believed, and believing could not search, as Frank Yale had suggested in his lecture. The moral to this is obvious to any one not reposing in and relying on blind faith, whether Spiritualist, Christian, or what not. Faith has covered many a trap-door, deception, miracle, fraud, and even crime, in the past, as it now conceals them; and, to “prove all things”, with the many, is a mere matter of belief, and not of demonstration. The message to Stewart had been carefully prepared several days beforehand, and the character, ambition, pride and weakness of the man had been duly considered in its composition. We were anxious to capture him, and we did. We were always careful to prepare a message beforehand, when the circumstances would admit of it, and so word it that a little taffy was mixed in–being sugar-coated, it was sweet when taken. No message which could hurt the feelings of any one was ever tolerated. The affidavit was as much a surprise to me as it possibly could be to any one, and it came near causing our Syndicate to resolve on stopping all further work. Some wee conscience stricken, and all of us were astonished at our success. “Where will it end,” says one. “They will all go crazy,” said another. We are getting too much responsibility on hour hands,” said a third. “I never expected it to become so serious,” said a fourth. But the rest enjoyed it and insisted on going ahead. In fact, the situation was such that we dare not make an exposure then, and were virtually propelled on in the work by the momentum acquired. Frank Yale, the notary whose name is attached to the affidavit, protested against swearing these parties to their statement in regard to me and my seances, and endeavored to persuade them to let the matter rest on their signatures alone, but they insisted on being sworn, were sworn, and we couldn’t help it. How could we? Stewart was proud of his communication, and wrote similar letters to Spiritualistic papers, which were published and added much to my notoriety and fame. Letters now came in from all parts of the United States and Canada in which particular inquiry was made in regard to me and my mediumship. Several lecturers on Occultism sent offers of partnership expressing a desire that I should travel with them, but as these propositions did not include my slate-writer and the Syndicate, they were promptly declined. Letters also came to be answered through my mediumship; these were generally sent to some friend in Liberal, as a precaution against fraud. They were all carefully sealed, they were to be intelligently answered by me without being opened or the contents known by any one but the sender. These letters were a difficulty and a nuisance. It is easy to seal a letter so that if it is opened the fact can readily be detected. Those who honestly sent such letters were expecting too much of a medium. The letters must be opened or guessed at. To open them meant low work, and detection in the end. A guess at best must be indefinite and unsatisfactory; but we tried it as an experiment on as few of them as we reasonably well could. We opened no letters. We found out what was possible concerning the writer and the letter, and then framed the answer in such a general way that it would surely hit on something the believe knew to be so; or the answer might have a double meaning and be read in different ways, according to the circumstances surrounding the sender, and depending somewhat on his faith also. As far as heard from, our answers were satisfactory and often convincing. Our success in this line of Spiritism exceeded our most sanguine hopes. In proof of this we insert a letter from Dr. Hovey, of Springfield, Mo. EDITORS OF THE LIBERAL: I discover Dr. Bouton’s seances have elicited much interest among the readers of your paper. Having visited and become acquainted with the Dr., I asked and obtained permission to make an examination of the house–but particularly the closet in which the mysterious writing was done. I was more interested in making an examination of the premises from the roof, having received a message in answer to a sealed letter sent there last Spring. The value of that message to me depended altogether upon the circumstances and conditions under which it was obtained. When invited by a relative living at Liberal, to send such a letter–addressed to some friend I had mourned as dead–giving it as his opinion from what he had witnessed at some of Dr. Bouton’s circles, that I probably would get an answer to such letter, I complied, and wrote my letter and took it to the local agent at the Adams Express Co. I requested Mr. Topping, the Agent, with whom I was well acquainted, to seal it with the Company seal, and mark it in such a way, with his private mark, that he would know (when it was returned) whether it had been opened since leaving the office. On giving him a general idea of the nature of the experiment I was about to make, he readily consented to assist me. He sealed the letter as requested, remarking that he would defy any one to open and close it without his being able to discover it. This letter was addressed with the name of a relative but without giving any clue as to the nature of the relationship. At my request Mr. Topping enclosed this in another envelope addressed to Mr. S. C. Thayer, Liberal, Mo., and put it in the Springfield post office. When my letter was returned it was accompanied by a small slate, nicely encased, on which a nicely written message appeared, addressed to me in the handwriting (or certainly a very good imitation) of the party addressed and expressing the true relation between us in the same endearing terms as when living. This package came by express. I took it to the agent, who opened it. The letter was carefully examined. Mr. Topping opened it, saw and read the message, and certified on the envelope that the seals were intact and the letter had not been opened since it left his hands. As the main point in my sealed letter had been answered satisfactorily in the message on the slate, it became a question of much interest to me to know just how it was done. Hence, on my first visit to Liberal after receiving the slate, I determined to make a thorough and exhaustive examination of the whole premises, including the closet, which, thanks to Dr. Bouton and his excellent wife, I was permitted to do. Other parties had preceded me in making a careful examination of the closet and its surroundings; but it was admitted that mine had been the most searching and thorough one that had been made. This was partly due to the ready assistance afforded by the Dr. and Mrs. Bouton who even tore up the carpet where once had been a trap door though which they passed their vegetables down to a small, temporary cellar, partly underneath the now celebrated closet. This was when they had as yet but on room of their now three room house. The west room or kitchen was built two years after the first, and the south room three years later. Under this south room I found a cellar 8 x 10 feet, thoroughly bricked up, but not reaching nearer than six feet of the room containing the closet. [See diagram on cover.] Every possible approach to the closet (above, blow, all around, inside and out) was carefully searched, and I came out from under the floor with my lamp and clothes covered with the despoiled webs of spiders, and thoroughly satisfied that no human hand could get into the closet except through the door–unless it was done by breaking the walls. I have been thus particular in giving the facts in regard to the closet, for here is a point gained, and the “trick” must be located elsewhere. No one having made such an examination of the closet will care to look any longer for the mystery in that direction. My next visit to Liberal was rewarded with an interesting seance at Dr. Bouton’s, giving me an opportunity to investigate the case in other directions. The room was well lighted, so that every move made by any one in the room was under the inspection of every other person present. 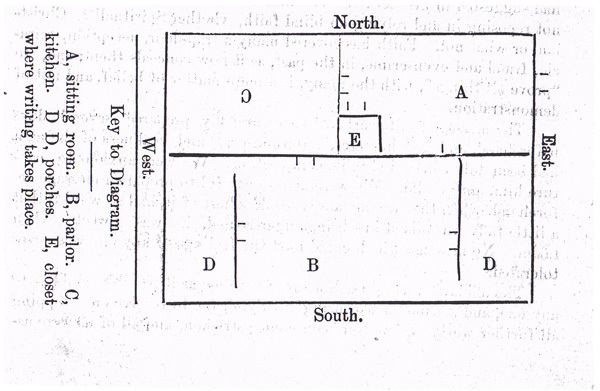 All were seated as marked and numbered in the diagram, an examination of which will help the reader to a better understanding of the whole matter [see cover of pamphlet.] A slate was washed and made clean, handed in and passed around the circle, given to Dr. Bouton and by him passed into the closet and laid upon a shelf, the door shut and fastened with a latch. Now all joined hands and a few common songs were sung, when three distinct raps were heard apparently on the door. This was understood to be the signal for opening the door of the closet, which was done by Dr. Bouton, his every movement being watched by the members of the circle. He brought out the same slate he had just a few minutes before put in there perfectly clean, and the following short message was found written thereon, and in precisely the same handwriting as that of the first before mentioned. NOTES: First, to look at E. Hovey of Springfield, Mo. He is Eleazar and easily found on the 1880 census in Buffalo, Dallas, Missouri. Eleazer Hovey was born in Trenton, Oneida County, New York, September 23, 1816. He was the son of Eleazer and Sybl (Coburn) Hovey. They moved to Indiana in 1820, where his father died. In 1826 his mother moved to the northeastern portion of Ohio…He was a charter member and one of the organizers of the Missouri State Dental Association…He married the first time in 1836 in Ohio to Miss Evelina Abell. They had two children, Mrs. Julia A. H. Colby and Mrs. Ellen A. Lewey. His first wife died on a steamboat at Louisville, on their way back to Ohio, and was buried at that city. In 1848 he was married to Miss Caroline E. Penniman, of Ohio. By her he had three children, viz: Eva Celestia Roundtree, Romeo Hamlet and Charles Eugene. He died April 19, 1898, at his home at Springfield, Mo. Whatever Hovey’s relationship to anyone in Liberal would be more difficult to find out. And now on to Frank Yale. Kind of looks like he was. Bouton is suggesting here he had at least four people working with him. I had previously doubted this many or more were involved–but perhaps I’m wrong. And Frank Yale, one of the early pioneers of the town? Frank L. Yale born 14 April 1848 in Lynn, Henry, Illinois to Gad Lowrey Yale and Abby W. Reed. He died 25 July 1930 in Joplin, Jasper, Missouri. In 1880 Frank was living with his wife Rachel A, 23, and daughter Luna O., 1, in Richland, Barton, Missouri. He was a teacher. In 1900 he and Rachel (Mann) were living in Joplin, Jasper, Missouri. Their daughter, Luna, was with them, as was a son, Walser O., born 1881, who would have been named no doubt for George H. Walser, the founder of Liberal. From what I can gather, Frank Yale’s wife was a believer in spiritualism. She is mentioned in Reminiscences of a Circuit Rider as coming to Liberal for one of the spiritualist camp meetings. Frank’s bio in “A History of Jasper County, Missouri, and its People” reveals nothing about his early association with the town of Liberal. Interestingly, in it his son’s name is listed as Walter, rather than Walser, which suggests a change of name for one reason or another, forsaking association with George Walser, but this was in later years.